The kids are back in school but they aren't the only ones who can get an education. On Thursday, September 10 at 7pm, the Arlington Historical Society opens its 2015-2016 program season with a talk by Garrett Peck, author of Walt Whitman in Washington, D.C.: The Civil War and America's Great Poet. The talk will take place in Marymount University's Reinsch Library auditorium and is free and open to the public. In advance of his talk, Garrett was kind enough to sit down with Boundary Stones and give us a preview. Check out the video above and learn more after the jump. 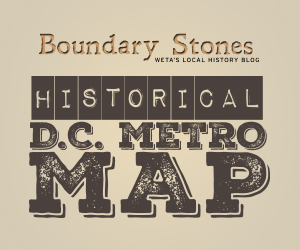 We're happy to have a guest post from local historian and friend of the blog, Garrett Peck who is the author of The Smithsonian Castle and the Seneca Quarry, just released from The History Press. Garrett's book tells the story of a (until recently!) largely-forgotten quarry in Seneca, Maryland, which provided the stone for the Smithsonian Castle and a host of other local landmarks. As he explains, the quarry also proved to be a source of scandal for President U.S. Grant in the 1870s. Repeal Day, December 5, 1933, was a day of wild celebration. The 18th Amendment was repealed, ending the great experiment known as Prohibition. Booze could finally start flowing again (legally) across the country and Americans were eager to imbibe. But, as kegs were tapped and bottles were uncorked from coast to coast, one place was left out of the party: Washington, D.C.